FACT: Colon cancer is just as common among women as men. In 2012, the American Cancer Society estimated that about 70,000 women and 73,000 men would be diagnosed with colon cancer in the United States.2 Let’s get everyone screened. 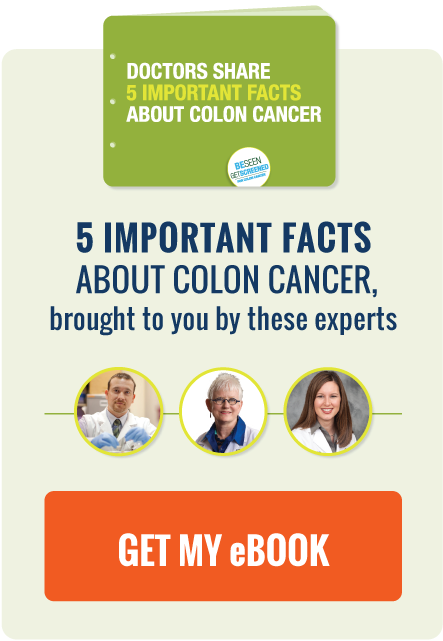 MYTH: Colon cancer cannot be prevented. FACT: In truth, when found early, colon cancer can be prevented from reaching an advanced stage. Before colon cancer develops, small areas of swelling may appear on the lining of the colon and start to develop small growths called polyps. While most polyps aren’t dangerous, some can grow larger over time and may develop into cancer. If the polyp is found early through screening, doctors can remove it and stop colon cancer before it advances. MYTH: I don’t have any symptoms of colon cancer, so there’s no reason to get screened. FACT: Regular screening is the key to early detection because colon cancer often has no obvious signs or symptoms in the early stages. By the time symptoms appear, the cancer may have already advanced to a higher stage. MYTH: Age doesn’t matter when it comes to getting colon cancer. FACT: More than 90% of all colon cancers are found in people who are 50 and older.3 The American Cancer Society recommends you start getting screened for colon cancer when you turn 50. People with a family history of colon or rectal cancer may be at a higher risk and should begin testing when they are younger. It’s important to talk to your doctor about when you should start getting screened and which screening method is right for you. MYTH: There’s only one way to get screened. FACT: Not true! Screening procedures have improved and there are a number of different methods available. Learn more about the different methods and talk to your doctor about which screening method is right for you. Don’t hide behind the myths. It’s time to take charge of your health with preventive colon cancer screening.